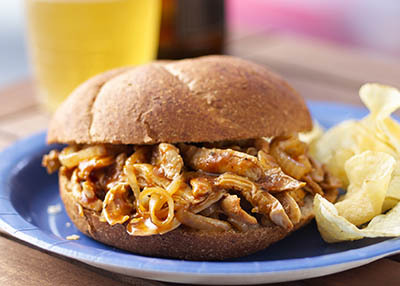 Cook this rich, pulled-chicken filling in a slow cooker ahead of game time—then re-warm and carry to the tailgater with Kaiser or onion rolls, coleslaw, baked beans, or kettle chips. You can also carry the cooked chicken in a Dutch oven that can sit on a small kettle or gas grill to reheat. Place onions in bottom of a 3-1/2- to 4-quart slow cooker. Place chicken on top. Mix beer, chili sauce, and seasoning. Pour over chicken. Cover and cook on LOW heat 5 to 6 hours. Transfer chicken to a cutting board. Using two forks, gently shred the meat. Mix with some of the cooking liquid. Spoon onto split rolls with some of the onion and more chili sauce. Gold'n Plump® Boneless Skinless Chicken Thighs may be substituted for Gold'n Plump® Bone-in Chicken Thighs.